Katusha’s Maxim Belkov won Sunday’s rainy stage nine in Tuscany with an impressive individual ride, achieving what is comfortably the biggest victory of his career so far and making it two stage wins for his team this Giro. Vincenzo Nibali (Astana) comfortably held onto the pink jersey, but Ryder Hesjedal (Garmin-Sharp) endured an unexpectedly detrimental day, being dropped on the final category-four Fiesole climb and losing one minute and six seconds to all the other contenders. There was no sign of a mechanical for the defending champion, who slips from fifth to eleventh on the GC, and at three minutes and eleven seconds down on Nibali and apparently lacking form, he seems unlikely to challenge for the pink jersey. All eyes today however were on the 28-year old Russian Belkov. Having found himself in the break of the day, he managed to escape with and ultimately get the better of Colombian Robinson Chalapud and the ever-lively Stefano Pirazzi. The three made an entertaining if inharmonious group, with each rider attacking each other and alternately yo-yoing off the back and the front. But eventually it was Belkov who proved the strongest when he established an unassailable gap attacking on the descent of the category one Vallombrosa, a little over 50 kilometres from the finish. After Pirazzi and Chalapud dropped back into the original break, Belkov had to fend off chases from another duo, this time another Columbian in Jarlinson Pantano and Argos-Shimano’s 22-year-old Tobias Ludvigsson, who finished third and fourth respectively. Ahead of them in second was Carlos Betancur (Ag2r), who attacked from the bunch towards the end of the stage and caught and out-sprinted the pair on the line. Betancur looked somewhat foolish as he crossed the line with his arms raised, not realising that Belkov had already won, but his aggressive effort could be a sign of things to come. The Ag2r rider has lost a lot of time in the first week, meaning he will likely be granted leeway to attack in the mountains as someone who will not be considered a threat on GC. The rainy conditions confronted Bradley Wiggins yet more difficulties. The Brit was dropped on the descent of the Vallombrosa, and at one point trailed the peloton by over a minute, however his Sky team dragged him back into contact with the other contenders with 25 kilometres still to ride. 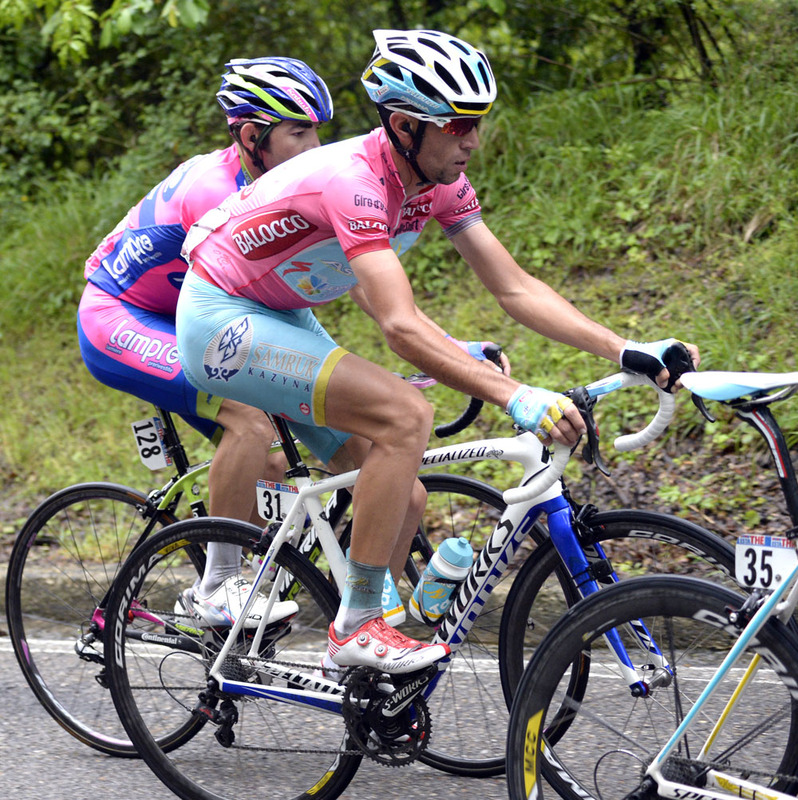 He struggled again at the back of the peloton again on the Fiesole, but hung on to remain in the group. His form remains a worry, however. Sunday also saw a new leader in the king of the mountains competition, with Pirazzi making up for the disappointment of missing out on the stage win by claiming enough points to usurp the jersey from Giovanni Visconti. Featuring as it did the first category one climb of the Giro, along with three other summits, the stage was always likely to ruffle up the competition, and Pirazzi proved his worth by out-climbing Visconti – who was also in the breakaway – to finish first over both the Vallombrosa and the category two Passo della Consuma. Not everyone made it to the finish today; Arnold Jeannesson, Francesco Chicchi and Thomas Gil all retired. More will no doubt follow them when the race hits the serious mountains on Tuesday, following tomorrow’s rest day.